Alexandra01297 442010work RestaurantSet in a fabulous location with beautiful private gardens, direct road-free access to the coast and magnificent views overlooking the Lyme Regis Bay and the Jurassic Coast. The atmosphere at the Alexandra is warm, friendly and welcoming, with thoughtful service to make you feel truly at home. Whether you are looking for a relaxing escape or culinary experience, we are dedicated to meeting your individual needs. 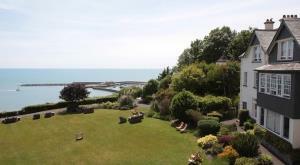 Set in a fabulous location with beautiful private gardens, direct road-free access to the coast and magnificent views overlooking the Lyme Regis Bay and the Jurassic Coast. Set in a fabulous location with beautiful private gardens and magnificent views over the famous Cobb harbour wall and out across the UNESCO world heritage site sea view of Lyme Bay, what better could be waiting on the other side of the curtains in the morning? The X53 Jurassic Coast bus runs from Exeter to Bournemouth, arriving at Lyme Post Office from 06.48 to 22.07 and from Bournemouth to Exeter arriving in Lyme Square from 06.49 to 19.21 (weekend times may vary). The 31 from Axminster to Weymouth arrives in Lyme Square from 06.36 to 22.41 and from Weymouth to Axminster 06.30 to 21.40 (weekend times may vary). The town service bus 71 operates daily from the square from 9.06 to 16.58. Main services from Waterloo to Exeter stop at Axminster for Lyme Regis, with bus links from Axminster station. See National Rail for more details. Routes from the north: M5, A37, A3066, A30, A358, A35, & B3165. Routes from the east: A30, A354, A338, A303, A31 & A35. Routes from the west: A30, A35, & A3052. Condor Catamaran Services to Weymouth from the Channel Islands and St. Malo. Wight Link Ferries between the mainland and the Isle of Wight. Car ferries from French ports to Plymouth, Poole, Portsmouth and Weymouth. See Condor Ferries for more details. Bristol, Exeter and Bournemouth airports.